Driving home from Washington Dulles airport last March after my two months of service in El Paso, I experienced an odd thought: This isn’t home anymore. Despite those gorgeous green mountains gathering around to welcome me, the lush countryside overpowering my senses after that dry, sandy El Paso landscape, and even the thought of my dog Cody whimpering and running around in circles to greet me, Virginia no longer felt like home. I wondered — what exactly am I coming home to? No, indeed, I am not the hobbit that I was. My journey to El Paso has changed my life. I knew it would even before I left. The question is—and has been for some time now—what is next for me? Yet I have asked this question with anticipation, hopefulness, and a spiritual awareness that I am being invited to something more. I heard this invitation last year when I first visited El Paso for that week-long “border immersion” trip. And I felt the pull in my heart to respond to that invitation. That’s what got me back there. Now I’ve heard, and responded to, another invitation. This one from the Incarnate Word Missionaries. Last week they invited me to be a lay missionary with their program in San Antonio beginning this August. It involves working with mostly Hispanic single moms and their children living in a transitional housing program called Visitation House. 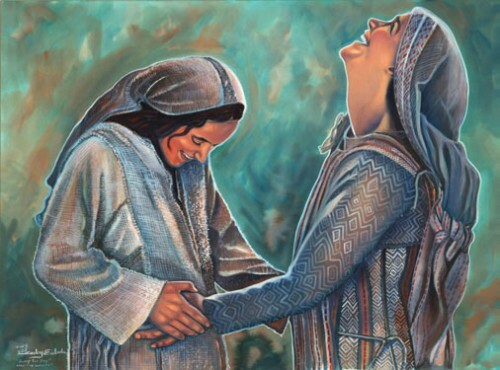 The name of the house refers to “the visitation” of Mary, who having just said “yes” to God’s plan of giving birth to Jesus, embarks on a long journey to visit her cousin Elizabeth, who is several months pregnant after many years of wanting a child. This is symbolic for me on many levels, not the least of which is a dream I had while serving in El Paso. In this dream, I find myself pregnant, at my age, with a new life that I feel unprepared—and unwilling—to handle at this point. Until the baby is born and I am cradling him in my arms. Looking into this newborn’s eyes, I feel such immense love. In that moment, every fear, every doubt, every apprehension simply melts away. And I totally accept this new life. The day before I said yes to this invitation from Incarnate Word Missionaries, I spent some time in silence, to simply listen and be present to God. I wanted to be sure, after all. I mean this is no small commitment. It involves risk. Starting someplace new. Stepping into the unknown. And opening my heart even further. I hear that message deep within me. Don’t be afraid to take the risks. Don’t be afraid to step into the center of your life. Don’t be afraid to follow your longing. So, I said yes to this invitation. I am ready to trust my deepest longing. To love and serve something greater than myself. To stand in the center of the fire. And feel fully alive.